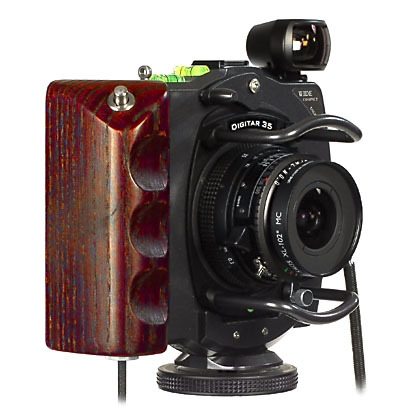 Wide Compact Body with Hasselblad-V interface for use with Hv compatible digital backs. This WDC-Hv comes complete with interface, with handgrip, cable release, spirit levels, tripod mounting, hooks for a handstrip and accessory shoe. The tripod mount has a 3/8" thread as well as Cambo's quick release profile. The Wide Compact body accepts the full range of Cambo WDS-Digital lenspanels as for use with the Wide DS, from 23 upto 120 mm focal length. An accessory shoe allows for the use of Cambo's WDS-580 viewfinder or any other applicable viewfinder solution.